Over the past several years I’ve been through at least one consumer-grade router from most of the major manufacturers (Cisco-formerly LinkSys, Netgear, D-Link, etc.). The best experiences I’ve had to date are 3rd party firmware builds such as DD-WRT and the Apple AirPort Extreme (5th Gen), which is my current router. DHCP Ranges limited to 256 addresses. I recently changed to a class B (172.x/16) address and was surprised to find Apple only lets you change the third segment on the DHCP range start: I’d chosen 172.27 as my network number. In the range start. I entered 172.27.1.1 and the range end, the first three segments were hard-coded to 172.27.1.x: limiting me to 256 addresses. What’s the point in a class B address when you can only specify 256 DHCP addresses. I’m sure Apple would love me to go out and buy another AirPort extreme to add another 256. I don’t need more than 256 addresses–yet (I’m sure that in coming years, everything with a power cord or a battery will have an IP, so I will), but I wanted to have easy to remember ranges for groups of stuff. Server on 172.27.1.x, Media players/servers on 172.27.2, Home Automation devices on 172.27.3, etc. No DynDNS support. I used to have a static IP. But switched to DynDNS to save me $15 plus tax a month. When I got the opportunity to review Luxul equipment, I jumped at the chance. Luxul deliver highly reliable solutions for use in the most demanding network deployments—ranging from residential and commercial LANs and WLANs to mobile Wi-Fi connectivity in heavy industrial and military applications. The equipment I reviewed (an XBR-2300 and XAP-1020) is representative of an installation in a typical residence or small business: a very large property may need additional access points. Many consumers buy a single Wi-Fi Router/Switch device. While this conserves space, its location can severely impact W-Fi performance. I have all my equipment rack mounted in the basement, which is probably the worst place in the house to put a Wi-Fi router: it’s the furthest point from most places you’d want Wi-Fi and is surrounded by a ton of metal and electromagnetic interference. As my review configuration comprised a router and separate wireless access point, splitting the Wi-Fi access point from the router, allows me to rack mount the router in the basement where my cable comes in and locate the Wi-Fi access point on one of the upper floors where it would provide optimal coverage. Unfortunately, Luxul products can only be purchased from authorized dealers. Both devices seem to be well constructed and are aesthetically pleasing. The XAP in particular, is quite stylish, The XBR-2300 comes complete with rack mount ears, which most professional installers would require. The XAP-1020 is equipped with a wall/ceiling mount bracket as well as keyhole slots for flush mounting. 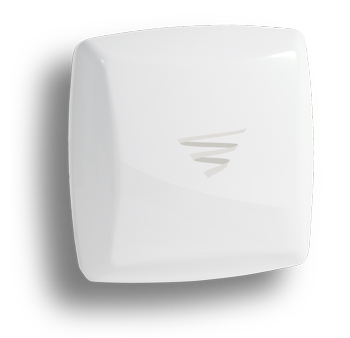 The XAP-1020 uses a Circular Polarized directional antenna technology. For maximum efficiency, it should be aimed towards the area to which you would like to provide coverage. With this in mind, the ideal placement option is usually on an outside wall pointed into the coverage area; or in a multi-level installation, on the top floor ceiling pointed downwards. In my case, I ceiling mounted it in the second floor hallway facing down. For those looking for easy setup, it’s as simple as plugging in the router, running an Ethernet cable and power (if not using POE) from the router to the access point. The access point automatically connects to the router and acquires an IP address. I was up and running in less than 10 minutes. Obviously, changing security settings and configuring port-forwarding and VPN access takes quite some time after this. In all, it took me about an hour from start to finish, but I have a lot of port-forwarding setup and I configured the VPN server too. For those wishing to modify the setup, a web-based interface is provided. On the whole, I liked the product a lot. Rather than run through every single feature (as these are found on many devices), I’ll mention the ones that really stood out. Auto Load balancing – The system searches for the WAN port with the lowest usage and automatically distributes load accordingly. This load balancing mode automatically manages flow distribution and bandwidth overlap. By virtue this also provides automatic failover if the one the connections fails. 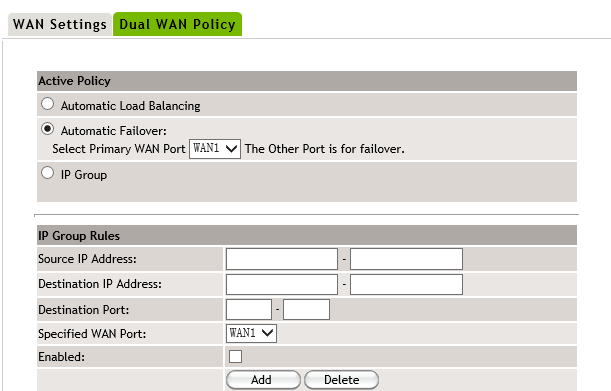 Automatic Failover – Users can choose a WAN port (WAN1 or WAN2), as the primary connection, while making the other port a backup connection. The XBR-2300 will automatically switch to the backup connection when the primary connection has an interruption in service. This mode would typically be used when the backup connection should not be used in normal service (for example, there are tariff charges associated with uses—such as ISDN/X.25). IP Group – This mode allows for the control of bandwidth provided to groups of client devices. When using this mode, specific IP address ranges are placed in groups and assigned to a particular port (WAN1 or WAN2). The source address, destination address, and destination port are all specified. 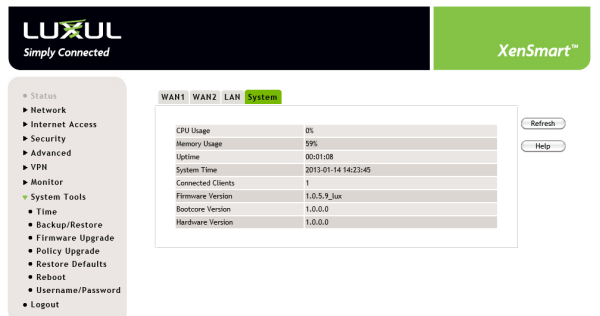 All data packets included in the defined range are then processed by the selected WAN interface. All data packets that are not included in the defined range are forwarded to the other WAN interface. There two key features here. Two routers can establish a WAN connection over a VPN tunnel, by making one a VPN server and the other its client. The VPN server can be used for remote clients to connect. I used this feature heavily during testing and it dramatically reduced the no of ports that I was required to forward. The advantage of a VPN, of course, is that once connected, I have access to everything. In contrast, without VPN, I would have to setup ort forwarding for every device and service combination I wanted to access. For those who unable to obtain static IP’s from their ISP or just don’t feel like paying $15/month for the privilege, here are a plethora of services out there that will track changes in your routers DHCP assigned address. In order for these to function, something on the local network needs to monitor the local WAN address and notify the DDNS service provider on change. I chose DynDNS.org for my test and it worked like a charm. For optimal performance, the access point should be located in the correct location. It’s likely that this could be somewhere visible in the main living space. Fortunately, the device is quite stylish and won’t look like an eye-sore. This allows eight separate SSID’s to be configured. Each can have different encryption methods, passphrases and VLAN assignment. If all devices are capable of supporting 40MHz channels, this can be selected and will either use channels 1 and 6 or 6 and 11. Running a network cable to an access point location is simple enough, but running power is typically a costly affair, as it requires an electrician. You also probably don’t want a power outlet near the ceiling, so the support for POE (Power over Ethernet) is very welcome. Testing against an internal copy of SpeedTest running on my LAN yielded a very respectable 37.78Mbps download and 40.17Mbps upload: fast enough for the most ardent streamers. The main thing is 5GHz support. I have several Apple devices that support 5Ghz channels. This frequency band is (so far) uncluttered. Below are the Wi-F networks within range of my house on the 5GHz and much more crowded 2.4GHz bands. In my case, it’s not a big deal, but the nearest property is 20 feet way, In an apartment/condo complex it’s a different matter. With the increasing demands placed on networks (even residential ones) these days, investing in commercial-grade networking is a sound decision. I wish I could charge consulting to my friends who went to a big box store and bought the consumer products on offer or took what their ISP offered and then called me because their streaming quality was dreadful or they couldn’t get a Wi-Fi signal in parts of the house. The configuration I reviewed is more than adequate for a typical house or small business. What’s also really nice about Luxul, is that if I need multiple access points (indoors or out), or a connection to a remote building, they have a solution available. In a nutshell, I’d highly recommend the products.